We make to order and keep STOCK! "Our business model is built on turn over which allows us to offer the product at an unbeatable price!" Looking for Aluminium windows in Sydney? Well have you come to the right place! 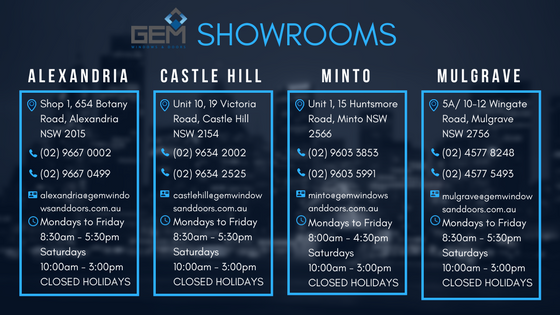 GEM Windows & Doors Sydney is a fast growing, 100% Australian privately owned company. We specialise in supplying directly to the public and offer standard size windows and doors as a cost saving alternative for aluminium and timber sliding doors, stacking doors, sliding windows, awning windows and double hung windows. With two sizeable showrooms (one in Alexandria, the other in Castle Hill) we have a wide range of aluminium and timber windows and doors on display. We also have a window and door warehouse in Prestons with over a 1000 stock aluminium sliding windows and doors in 4 different colours. Our aluminium doors and windows range includes aluminium sliding doors, stacking doors, awning windows, double hung windows and sliding windows as well as bi-fold aluminium doors and french aluminium doors. We offer impeccable quality and present unbeatable value for both domestic and commercial requirements for small projects and larger scale developments of dwellings under 3 storeys as our products come assembled and pre-glazed. With production being based in Sydney, we can offer competitive lead times of 3-4 weeks for residential windows and doors and 5-6 weeks for commercial windows and doors. Bifold doors are just the beginning at Gem Windows and Doors Sydney! We use an Australian designed, tested and manufactured aluminium window and door system, offering a wide range of modern designs with a quality finish. The full range of our aluminium doors and windows can be viewed in the Custom Products section and covers both residential and commercial (for residential application). With custom size products, you have the flexibility to nominate the exact frame size to fit your existing opening. If you are working on a new build project – you can take advantage and save our Standard Size aluminium windows and doors in both Residential and Commercial ranges, as well as Commercial Double Glazed items. We specialise in supply only and cater to a wide range of needs when it comes to timber and aluminium doors and windows. Our standard size range offers great savings, whether you are looking at replacing one window or all windows and doors in your home. Our custom range includes the Residential single glazed series, including sliding and stacking doors, sliding windows, awning windows and double hung windows. We are now happy to offer standard size Commercial products for residential application which include sliding and stacking doors, sliding windows and awning windows. Our Commercial standard size series can also be supplied with double glass and offers great value at a very competitive price. The full range, sizes, configurations and price list can be viewed in the Standard Price List section. Why Use GEM Windows and Doors Sydney? Our business model is built on turn over, therefore we are confident that when it comes to standard sizes our prices are the best in Sydney and even New South Wales. Our product is 100% Australian made and meets all the required standards. We deliver or allow pick up from factory which provides another opportunity to reduce your cost. We specialise in a standard range of items, with standard finishes and fixtures – we keep it simple and pass on the cost saving to our clients. We care about every order – whether it is one window or a house lot. Majority of our clients are DIYers and owner builders and we value all business regardless of the size. GEM aluminium windows and doors are manufactured to the Australian standard to ensure compliance and quality assurance. In the Info & FAQ section you can review the frequently asked questions and answers and view additional information. If you know what you are after, request a quote on-line by filling out the quotation form. You can also contact us with any questions by calling our office or sending us an online contact form through our website. We also invite you to visit our Sydney Door and Window Showrooms in Alexandria and Castle Hill where you can view the full range of windows and doors on offer, see the quality of the product, chat to us about your project, discuss pricing and request a quote.